P.S. Don't forget to vote today! I have a book of recipes for babies and kids called "First Meals" by Annabel Karmel that I bought when Aidan was a baby. I like to cook, and I wanted to make healthy meals for my child. Simple enough, right? This book has lots of great features like sample menus (helpful when you're a first time mom and have no idea how much food to give to your kid at any given time) and some fun recipes. It also has a lot of very involved recipes with several ingredients, plus enough parsnips, leeks and unfamiliar entrees to give away the fact that the author is most definitely British. I also have this ridiculous habit of deciding to cook from this book without taking a moment and actually thinking to myself, "is this a reasonably simple recipe?" before jumping right in. This has led to giant messes and some hilarity -- but mostly messes. I remember making Aidan the "baby bolognese" and thinking to myself while I chopped garlic, measured spices, and peeled and seeded tomatoes (I figured diced tomatoes from a can weren't good enough for MY baby!) that I had never even put this much effort into making my OWN meals. This was, of course, several years ago before I became the accomplished chef and diced tomato buyer that I am today, right? 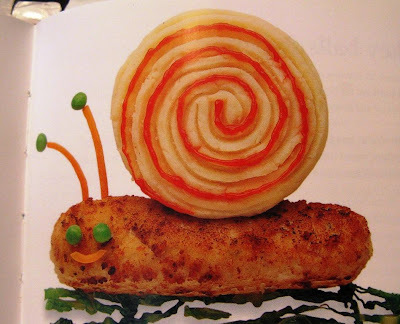 Well, today I decided to make Aidan some chicken sausages from this cookbook which were "dressed up" as snails with a little mashed potato "shell" to up the kid-friendly factor. I put bread crumbs, raw chicken, grated apple, onions, and a little sage (my own special touch, master chef that I am) into the food processor and mixed it all up. At this point, I'm feeling pretty hot. The recipe then tells me to shape the chicken mess into sausages, roll in flour and saute until cooked through. 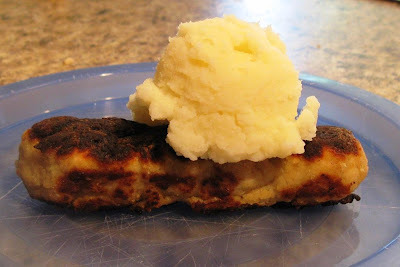 Raw sausage is really gooey and sticky. Perhaps this is why professional sausage makers use casings. Babies who have been happy all morning invariably decide to start screaming at the top of their lungs when their mom's hands are coated in gooey, sticky, raw chicken. Toddlers who have been playing in the backyard are compelled for cosmic reasons to sneakily open the garage door and wander into the front yard to play with a next door neighbor boy so mom can have a heart attack and run through the backyard, garage, and into plain view of all neighbors looking for said toddler, covered in gooey, sticky, raw chicken. Babies continue crying when you most need them to stop. Flour is very messy and can travel great distances through the air. Just remember that -- it's applicable to many real world situations. Presentation suffers when babies are screaming, crawling around after you through the kitchen and pulling themselves up on your pantlegs while you prepare culinary masterpieces. Those are awesome. I love you. Hi, I just found your blog and have been glancing through your post when I stumbled upon this one and about died of laughter. Oh gosh, I love the honesty that comes through in your posts and I too, have a deep love of cheese. IN fact, last year for my birthday my husband took me to a hotel for my birthday and then to a grocery store where we went to the international cheese section and spent $80 on cheese and sausages. Best birthday ever.